The Barnstead Firefighters Association is pleased to announce its 7th annual 5K Road Race and Fun Walk to start at the Barnstead Parade grounds on August 18 at 9am. Proceeds from this year’s race will benefit the Barnstead Firefighters Association. Pre-registration is $20 and must be received by August 14, 2018. Registration forms are available at www.bfr06.com; Email: bfa5kroadrace@gmail.com or Call: 603-312-5648. Online registration is also available at www.running4free.com. Race Day Registration is $25. I am writing to share with readers about a new resource available in our community. Support groups and peer support groups are valuable tools for people coping with a loved one’s substance use. Support groups are dedicated to improving the quality of life for people by offering support, education, and resources. A new support group called “Circle of Hope” will begin in Barnstead on August 13th. This group is for family members and friends who have a loved one struggling with substance misuse. Through peer sharing and educational presentations, participants can learn coping skills to help themselves and their loved ones. Most of all they learn they are not alone. Circle of Hope facilitators are trained by NAMI, the National Alliance on Mental Illness. The Circle of Hope group will meet on the 2nd and 4th Mondays of each month from 6:30 – 8:00 pm at The Congregational Church of North Barnstead UCC, 504 North Barnstead Road, in Ctr. Barnstead. Meetings are held in the small building next to the church. The first meeting will be on August 13th. We hope that this new group will assist those in need of support in Barnstead and in the surrounding communities. Please share this important information with your friends and neighbors. For more information, call or text Charlene LaFleur at 603.715-0509 or email at caflower63@gmail.com. Join us Saturday evening from 6 -8 on the Barnstead Parade for an evening of Blues music. 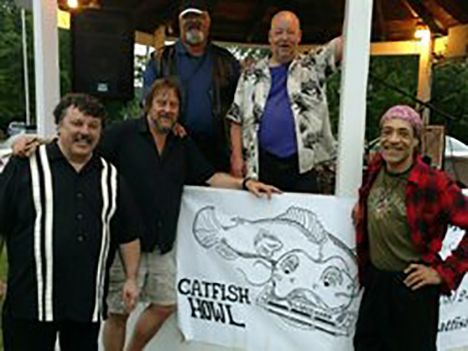 Joining us this Saturday August 11, 2018 will be Catfish-Howl. Bring your chairs and dancing shoes for some music from the 1940’s on up. The Catfish cover traditional Blues and Blues Rock, with a lot of surprises thrown in including some original Blues. They are a 5 piece band – Zydeco= Blues, Rock, Country, New Orleans Style, with covers and some originals. They may even throw in a Cajun tune. Bring your lawn chair, blanket and family for a fun evening, the Barnstead Parks & Rec Dept will be selling refreshments. Graphic Novels Club Fandom Party! Celebrate your favorite Fandom at the library on Wednesday, August 15th at 3pm. Come dressed as your favorite characters to participate in “Greek Culture” games and activities! Light refreshments will be served. This event is for ages 9-18. Join Lindsey on Thursday, August 16th at 6pm to sing, play instruments, or perform poetry. Light refreshments will be served. This event is for ages 14-18. Please contact Lindsey or Melissa to sign up to perform. The library is having an outdoor dance party on Friday, August 17th at 6pm. Send us your playlist requests before the event. Light refreshments will be served. This event is for ages 10-14. Saturday, August 18th will be the last day for all participants to log books for the summer reading program. Individuals can log books at the library or online through that date to complete the program and receive awards and ending packets. The unmistakable sound of multi-Dove and Grammy Award-winning recording artist, David Phelps will be featured in Alton Bay, NH, on Saturday, August 25, at the Alton Bay Christian Conference Center, located at 37 Mt Major Hwy (Route 11). This exciting concert event begins at 7:00pm. Once a childhood musical prodigy from Tomball, TX, David Phelps earned a bachelor’s degree in music from Baylor University. Since then, he has become a nationally celebrated vocalist, whose gifts and talents are matched by none. Perhaps best known as the powerful tenor for the multiple Grammy and Dove Award-winning Gaither Vocal Band, Phelps is constantly building on a career that has already been groundbreaking. Emerging as a leading voice in contemporary Christian music, Phelps has been winning the hearts of audiences all over the world for more than two decades. He has performed at numerous prestigious venues across the globe, including the White House, New York’s Carnegie Hall and the Sydney Opera House in Australia. With 14 solo albums to his credit, David’s electrifying voice has moved audiences from all walks of life, crossing generational and stylistic barriers. This event, featuring David Phelps, will also include talented female vocalist, Charlotte Ritchie, as well as Phelps’ seven-piece musical entourage. Many of the songs featured during this exciting evening are included on Phelps’ brand new release, Hymnal. Phelps lends his three-octave range to some of the most treasured hymns of the church with this new recording, which showcases masterful vocals and lush arrangements of such cherished gems as “Amazing Grace,” “How Great Thou Art,” “In The Garden,” “Victory In Jesus” and “It Is Well With My Soul.” Each song takes the listener on a journey of inspiration and worship in song. Any music lover, regardless of stylistic preference, will not want to miss this special evening of worship and community celebration as the Journey of Faith Tour, featuring David Phelps, comes to the Alton Bay Christian Conference Center in Alton Bay, NH, on Saturday, August 25. Event information may be obtained by calling 603-875-6161 or www.altonbay.org. Ticket information is available by calling 1-800-965-9324 or visiting www.itickets.com or www.davidphelps.com.